Designed to support up to 275 lb. 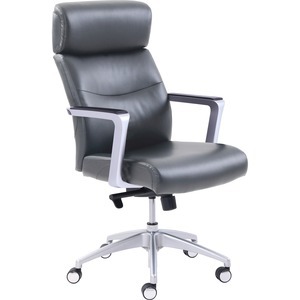 Chair features a commercial-grade bonded leather exterior to provide a timeless look along with elegant comfort. Durable arms with a padded top offer extra support for maximum comfort. Four-point, knee-tilt seat plate allows you to adjust the chair to fit your exact needs. Durable nylon base supports up to 275 lb.